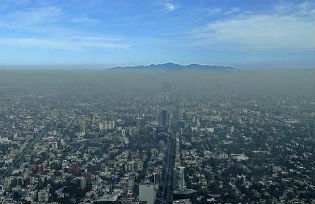 A blanket of smog covering Mexico City in 2010 (Image by Usfirstgov). Mexico's capital used to be the most polluted city in the world. Pierre-Marc René explains how it turned its fortune around. Red alerts, curfews and health crises resulting from air too hazardous to breathe – for those who lived in Mexico City in the 80s and 90s, its recent pollution problems are all too familiar. Back then, lead, ozone, carbon and sulphur were so rife in the atmosphere that residents claimed they were causing birds to fall out of the sky. The city authorities implemented an emergency action plan to revolutionise the city’s transportation system with some miraculous results. For the first time in 14 years, unusually high levels of ozone in the valley around Mexico City, have led authorities to activate an environmental contingency plan, restricting vehicle use and ordering factories to limit greenhouse gas emissions (GHG) by up to 40%. But the infrequency of such warnings serves as a reminder of how far the Mexican capital has come. “We used to have levels of pollution similar to those in Beijing and northern China today,” recalls Antonio Mediavilla, director general of the air quality management programme at Mexico City’s environment department (Sedema). As Mexico’s economy grew in the ’80s and ’90s, the sharp rise in emissions from transport and industry landed its capital the unenviable accolade of world’s most polluted city. Then, in 1996, city and regional governments introduced the celebrated Management Programme to Improve Air Quality (Proaire in Spanish), which harnessed the will of both civil society and business interests to tackle the problem. The Proaire package of reforms managed to bring Mexico City’s air pollution down from a dangerously high rating of 300 on its Metropolitan Air Quality Index (Imeca) in the 80s, to more recent averages of less than 150. Whereas once levels of ozone hovered around 500 parts per billion (ppb), they now range between 120 and 150 ppb. Proaire now extends to 11 cities nationwide. In 1986, Mexican officials named 21 different measures to tackle the air pollution crisis. At this time, natural gas began to replace fuel oil in industry and in thermoelectric power generation in the Valley of Mexico – which comprises Mexico City, the federal district of Mexico and the states of Morelos, Puebla, Tlaxcala and Hidalgo. Local governments also began to register air quality more systematically. In 1988 the general law of ecological balance and environmental protection (LGEEPA in Spanish) established that federal authorities must execute emissions reduction programmes in areas under their jurisdiction. Meanwhile, state governments had to outline their own programmes to improve air quality and submit them to the ministry of environment and natural resources (Semarnat in Spanish). As part of a new, broader survey of emissions, the law also obligated local authorities to implement programmes verifying those from transport, the largest emitting sector in metropolitan areas in the Valley of Mexico. In 1989, city and regional governments introduced the Cars Don’t Circulate (Hoy No Circula) programme, which restricted a fifth of all vehicles on rotating days between Monday and Friday, depending on the last number on a vehicle’s registration plate. Victor Páramo, coordinator of health and pollution at the National Institute of Ecology and Climate Change (INECC) explains that the main precursor to Proaire was introduced in 1990. This programme made verifying vehicles obligatory and established a supply of unleaded petrol and stricter vehicle emissions standards by introducing catalytic convertors. It also expanded the Metro system. Proaire’s precursor included the collection and publication of mathematic and photochemical analyses which showed very high levels of pollutants in the blood, especially in children. This prompted a widespread social mobilisation led by green groups, which organised protests and demanded inclusion in public fora on air quality. “Proaire is a space permitting a series of agreements between different actors, as much from private enterprise as from the different government dependencies and NGOs,” says Ana Martínez, director general of the programme for air quality management, emissions registration and transparency on pollutants at Semarnat. The governments of Mexico City and the federal district then advanced joint measures to tackle pollution through the newly-created Metropolitan Environment Commission, known today as CAMe. Proaire also applied new restrictions on fuels, which limited vapour pressure, olefins and aromatics, benzene and sulphur, following which state-owned oil company Petroleos Mexicanos (Pemex) introduced a premium fuel. It also established management plans for protected natural areas in Mexico City and the metropolitan area. In 2001 and 2011, the second and third phases of Proaire oversaw the renovation of Mexico City’s fleet of taxis and minibuses, the creation of the Metrobús network and further expansion of the Metro. The plan began to monitor particulate matter smaller than 2.5 micrometres (PM2.5) and 10 micrometres (PM10), and included a system of warnings for when levels of ozone or millimetre particles were so high they were dangerous to human health. Warnings advised citizens to stay indoors during the day and restrict vehicle use. In the 1980s the Mexican capital spent most of the time on high alert. Nowadays warnings are issued just three or four times a year. Mediavilla says that despite Proaire’s success, there are still many obstacles. According to Martínez a cooperative effort is needed. “We all have to do our bit to tackle poor air quality,” she says, pointing out that national plans now cover 67 priority areas within Mexico which have air quality problems owing to their basin geography. According to Martinez, the ministry of environment is working on management plans that will extend across every state in the country so as to form the beginnings of a nationally coordinated agreement. Among the issues that Proaire still has to clamp down on are the widespread use of liquefied petroleum gas (LPG or propane) in metropolitan areas, ongoing traffic congestion and the persistence of PM2.5 and PM10, which are difficult to control. The United Nations Environment Programme (UNEP) recently indicated that in 2010 the cost to the Mexican government of health spending as a consequence of air pollution hit US$29 billion dollars. “We’ve moved from macro air quality measures to much more useful ones, which don’t only detect primary pollutants but also secondary ones, like ozone, and that’s why it’s much harder to control,” says Martínez. Martinez says that despite its successes, it’s not possible to copy directly from the Mexico experience because each city has its own particular set of conditions. However, she adds that technologies are now much more efficient and can improve on measures introduced 20 or 30 years ago. Páramo says that Bogotá’s ‘Peak and Plate’ initiative (Pica y Placa in Spanish) borrowed from Hoy No Circula, but applied restrictions only at certain times of the day, since the latter’s daily vehicle use had encouraged the purchase of a second car. Once cities have identified their own unique problems, compiling a reliable database and strategising for the short, medium and long term are key components to success, according to Martinez. “You have to analyse very carefully the characteristics of a different municipalities, especially the sources of pollution,” she says.